2042, CENTER CAP COPY, 94-03, DODGE, 2500 & VAN. CHROME, 8 FAKE LUG NUTS, SNAP ON, NO LOGO. 8-1/4" DIA. 2043, Center Caps used, 94-03, DODGE, BLACK PLASTIC CAP, RAISED RAMS HEAD, 8 FAKE LUG CAPS, METAL RING, SNAP ON STYLE, 8-1/4" DIA. 2124, CENTER CAP USED, 00-02, DODGE, 2500, CHROME, ENGRAVED DODGE RAM HEAD, HEX NUT CENTER, 8 FAKE LUG NUTS. 4 SNAP ON LUG CLIPS, 8-3/8" DIA. 2125, CENTER CAP COPY, 16", 94-99, DODGE, 3500 PICKUP, CHROME PLASTIC CAP, 8 FAKE LUG NUT CAP, NO LOGO. ALSO FITS WHEEL COVER 539. 3421R, CENTER CAP, CLOSED, 16", 01-05, FORD, F-250, F-350, SUPER DUTY, EXCURSION, CHROME ENGRAVED FORD OVAL IN CENTER, WITH 8 FAKE LUG NUTS, 8 PLASTIC CLIPS ON LUG NUTS, 8-1/4" DIA. 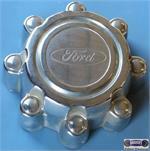 3620/3598b, CENTER CAP USED, FORD, F250, F350, 05-08, CHROME, FRONT, 8 FAKE LUGS, 8-1/4 DIA O/U 3598 CENTER CAP. Price: ORDER UNDER 3598b CENTER CAP. 3843, CENTER CAP USED, 11-16, FORD, F250, F350, SUPER DUTY, CHROME, BLUE FORD LOGO, 8 FAKE LUG NUTS, 8-1/4" DIA. 5125b-F, GMC CENTER CAP FRONT USED, 01-08, GMC, SIERRA, 3500, SILVER BASE, SCREW ON, 8 FAKE LUGS, BLACK CENTER, CHROME OUTLINED RED GMC, 9-1/2" DIA. 5198b, CENTER CAP USED, 04-08, GMC, SIERRA, PAINTED SILVER, BLACK CENTER, RED GMC, 8 FAKE BLACK LUG NUTS, 8-1/2" DIA. 5198c, CENTER CAP USED, 04-08, CHEVY, SILVERADO, SUBURBAN. GRAY, SILVER CHEVY BOWTIE, 8 FAKE BLACK LUG NUTS, 8-1/2" DIA. 542a, CENTER CAP USED, REAR, 00-02, DODGE, 3500, CHROME PLASTIC CAP, 8 FAKE LUG CAPS, RAISED RAMS HEAD LOGO, 4 METAL CLIPS, 9-3/4" DIA.